e_Buah is the institutional repository of the University of Alcala. Its purpose is to provide open access to academic and scientific material produced at the University as well as to ensure the preservation and enhance the visibility and impact of the contents generated by members of the University. e_Buah content is organised according to Community, where each Community corresponds to a different subject area at the University of Alcala. Each Community may host unlimited Sub-Communities and Collections. Each of these Collections may in turn host unlimited items. e_Buah contents, Communities and Collections are increasing every day. Contents include papers, studies, theses, technical reports, conferences and other documents in various digital formats. The indices enable users to consult content according to selected criteria. There are five different indices: Communities and Collections, Date of Publication, Author, Title and Subject. Any of these may be used to search and retrieve information. Communities and Collections : This index lists Communities in alphabetical order, together with the Sub-Communities and Collections defined within each Community. Date of Publication : This index lists all items on e_Buah in chronological order from the oldest to the most recent. Author : This index lists all authors published on e_Buah in alphabetical order. Title : This index lists all titles published on e_Buah in alphabetical order. Subject : This index lists all items published on e_Buah by subject in alphabetical order. E_Buah may be consulted by any user. However, registration is required for certain services and features. · Subscribe to a given Collection and receive email alerts when new items are uploaded. · Go to the “My e_Buah” page. Only authorised users of the University of Alcala may upload an item to a Collection. To begin a search of the entire repository, use the bar at top left hand side, enter a keyword and click “search”. To search within a specific Community, Sub-Community or Collection, select the location and the option to search within this Community, Sub-Community or Collection will appear. “ a ”, “ an ”, “ the ”, “ in ”, “ on ”, etc. Truncation : Using an asterisk after a word stem will retrieve any document that begins with that stem. For instance: the search document* will retrieve “documentation”, “documentary”, “documentaries”, etc. Stemming : The search engine also expands words automatically with the usual endings, including plurals, tenses, etc. Continuing with the previous example, document* will also retrieve “documents” and “documented”. AND – This operator limits the search by locating all documents containing the words entered with the operator. For instance, the search “styles AND ceremonies” will retrieve any document that includes both words. OR – This operator expands the search by locating all documents containing any of the words entered. For instance, “styles OR ceremonies” will retrieve any document that contains at least one of the two words. NOT – This operator excludes the word written after it. For instance, “styles NOT ceremonies” will retrieve all documents containing the word “styles” except those also containing the word “ceremonies”. Using the minus sign will obtain the same result (“styles – ceremonies”). Parentheses : These are useful to combine different search terms. Boolean operators can also be used here, for instance “(sermon OR solemn) AND (styles OR ceremonies)”. An advanced search enables users to limit the field in which they are searching and to combine the search with Boolean operators. The “Search Scope” box at the top enables users to limit their search to a specific Community or Collection. To search the entire repository, the box should be left in its default position. Then, select the search field and enter a word or phrase in the column situated on the right. Boolean operators can be used here as described above. The system will ask for identification before allowing access to areas requiring authorisation. All users can register. Community authorisation is required for uploading contents and other restricted functions. Click on “My e_Buah” or “Sign in” to register. Either option leads to the “new user” screen. After that, an email address and a password must be entered in the identification form. The email address must include user name and domain name (not case sensitive). The box to enter the password is case sensitive. Authorised users of the University of Alcala must request permission from the e_Buah Administrator to upload content to a Collection. Click on “My e_Buah” to log in. Then, the recommended option is to locate the Collection to which the content will be uploaded and click on “Upload an item to this Collection”. An alternative option is from “Uploads/Deposits”; click on “Start a new upload” and choose the appropriate Collection. 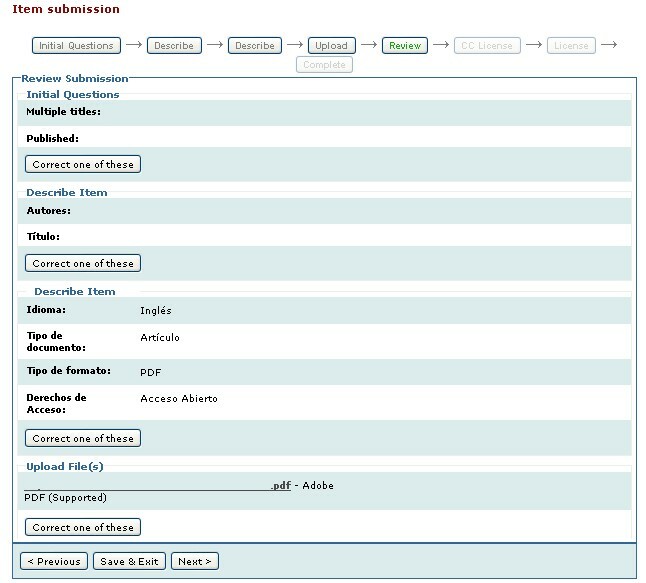 Different screens will then appear requesting upload details which must be filled in to complete the process. It is important to tick these options if the work has more than one title (such as an abbreviation, acronym or title in another language) or has been published before. After ticking, different document description options will be shown. Authors : May be a person, organisation or service responsible for creating or contributing to the content of an item. As many authors as required may be entered by clicking the “Add” button. Use the field “Surname” if the author is an organisation. Title : This is a compulsory field for providing the complete name by which the item will be known. Other titles : This field will appear if the previous option “Multiple titles” was chosen. Revised : Select one of the options displayed on the drop down menu. Publisher : As with the previous filed, this appears if the option was chosen. Give the publisher’s name. Date of Publication : This field appears if the option “Published” was chosen. The month and day may be left blank if not known, but the year is required. 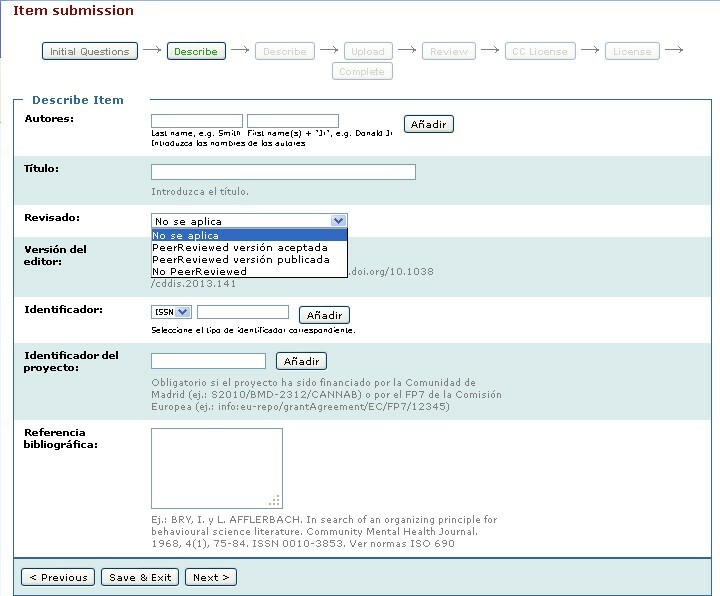 Bibliographic reference : Again, this field appears if the option “Published” was chosen. Citation information can be given here. For journal papers, write the complete journal title, year, volume number and pages (e.g. International Journal of Psychology, 2013, V. 48, Issue 6, pp. 1009-1017). For book chapters, include the complete title of the book, place of publication, publisher, year and pages (e.g. Studies in Modern Capitalism. New York: Cambridge University Press, 1982, pp. 78-96). Type , : Select the type of work that best describes the item. Language : Choose the language in which the item is written. If the item is not a text document and the language does not make sense as part of the description, choose the default option: N/A. Type of document : Choose the appropriate type of document from those displayed. Enter the keywords : As many keywords as required may be entered by clicking the “Add” button. File preservation: use PDF and JPEG formats. It is e_Buah policy to preserve files in these formats and to take the necessary steps to ensure future access to the files. Click “Attach and add file” whenever adding a file. The information given in “File Description” details the kind of information contained in a file, e.g. main article, pictures, etc. This allows users to amend erroneous data and to modify the uploaded file. and complete the information requested on the following screen. Accept the licence that allows the University to make the uploaded document publically available on e_Buah. The author will receive the permanent URL of the document via email once the upload has been reviewed by the University Library and is available on e_Buah. Once an item forms part of the e_Buah repository, a permanent URL is assigned. This means that the identifier will not change if the system is migrated to other hardware or modified in any other way. e_Buah ensures URL security so that the item can be safely cited in publications and other media. Our permanent URL addresses are registered with “Handle System”, a tool designed to assign, control and resolve persistent identifiers for digital objects and other Internet resources. “Handle System” is administrated by the Corporation for National Research Initiatives (CNRI), which employs, encourages and promotes research in the public interest. Access is restricted to registered and authorised users. “My e_Buah” is a personal page maintained by each user. It can include a specific user’s list of items in the process of delivery or a list of items requiring further attention such as editing, revision or checking. Click on “Profile” in “My e_Buah” to change user password and information. Users can subscribe to the Alert Service in order to receive daily email notifications about new items added to Collections. Enter the Collection of interest and click on the “Subscribe to this Collection” button. Users may subscribe to as many Collections as they wish.